The MetalCloak Aluminum TJ Wrangler 3.5" Long Travel Short Arm Suspension Kit, ARB Edition, has all our best technology as our top of the line kit, including the high-misalignment vibration-dampening Duroflex™ Aluminum Control Arms, but without the 6Pak™ Shocks. Instead we worked closely with ARB, a leader in the off-road industry, and decided to add ARB's Old Man Emu Nitrocharger Sport Long Travel Shocks as an option to our LTSA product line. Who should use this kit? 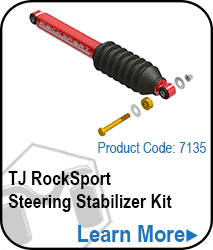 This kit is perfect for the TJ owner who wants the best flex and the best ride quality, but doesn't need the unprecedented off-roading articulation and pre-running capability of the 6Pak Shocks. Or if you are still running stock fenders, and want the best suspension on the market today, then this kit is perfect for you. Note: MetalCloak Recommends You Have a Suspension Specialist Align Your Jeep Once MetalCloak Suspension is Installed. Note: MetalCloak does not recommend powder coating your True Dual Rate Coils. See instructions for additional details. Old Man Emu Long Travel Nitrocharger Sport Shocks. Perfect as an intermediate step for the TJ/LJ owner who wants the best, most comfortable quality on or off road, but does not need or want the 6Paks Shocks just yet. 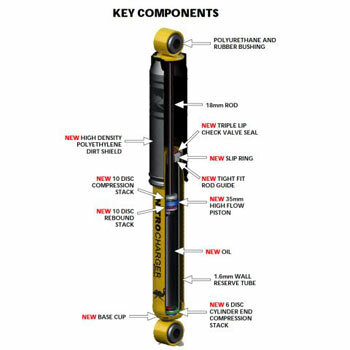 We chose the Old Man Emu Long Travel Nitrocharger Sport Shocks after closely working with Industry Leader ARB and looking at all the other aftermarket shocks available. While most companies brand their own standard shocks (using international manufacturers like Bilstein) and uses a company like King or Fox for their top end shocks, we are doing the opposite. We manufacture our own (in house) top end shocks, the 6Paks, but decided to not try and brand basic shocks... the ARB Old Man Emu Shocks work according to our high expectations. True Dual Rate™ Coils give you stability and comfort that far exceeds single rate or progressive coils. Adjustable bump stops ensure you'll have the correct bump every time. A LEGENDARY SHOCK FROM A LEGENDARY COMPANY. 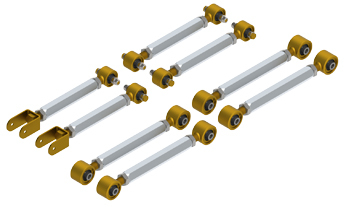 Old Man Emu's proven line of Long Travel shock absorbers includes some of the latest shock valving technology achieving a whole new level of ride quality. Most dual and monotube shocks typically feature a two-stage valving process, the new OME Nitrocharger Sport Long Travel Edition features a triple-stage valving process rivaled only by a remote canister adjustable shock. 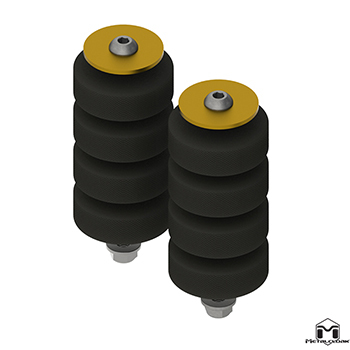 These have been stacked into the most durable shock body and adjusted by load capacity for you. And the additional travel makes it one of the few shocks that can take on the flex Metalcloak offers. Fitting with our soft shock, stiff coil, philosophy, the off-the-shelf valving of the OME shocks have the perfect synergy with our True Dual Rate Coils. 68 DEGREES OF MISALIGNMENT. THAT'S MAKES IT FLEXY. 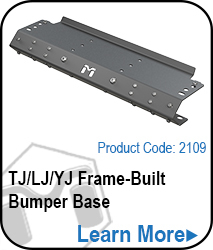 TJ/LJ Wrangler bolt-on suspension kit. Period. MetalCloak has taken the best features of the most widely used control arm joints and combine those features to create the Duroflex Joint, producing a Low-Maintenance, High-Misalignment (34°), Self-Centering, Rebuildable Joint with an OEM quality ride. MetalCloak's Duroflex Joint provides 28° more articulation and flex then typical control arms! 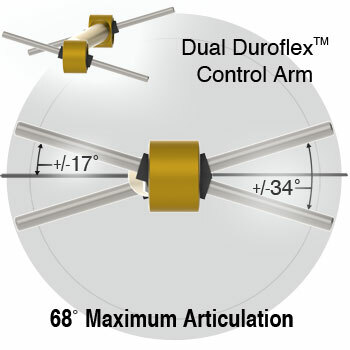 The Duroflex Aluminum Short Armsare aluminum short arms designed to accept Duroflex Joints at each end. 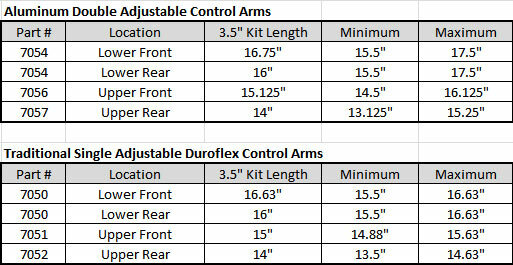 Note: These Control Arm Specifications are Just Starting Points. ALL JEEPS ARE DIFFERENT. MetalCloak Recommends Seeing a Suspension Specialist for Correct Control Arm Lengths For YOUR Jeep. This short video covers what you need to know about the basics of Single Linear Rate Coil Springs and MetalCloak's True Dual Rate Coils. 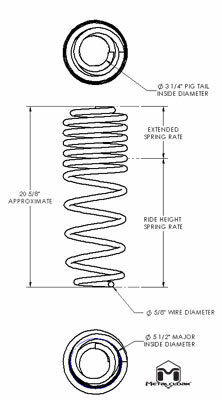 How Linear Coil Springs and MetalCloak's True Dual Rate Coils work and what to expect when using them. 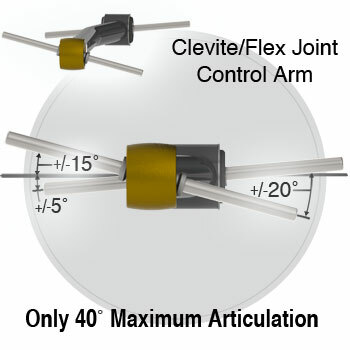 WHAT ARE TRUE DUAL RATE ™ COILS? MetalCloak TJ/LJ Wrangler True Dual Rate™ Coils have some of the longest free lengths in the industry for greater articulation without sacrificing the OEM ride quality. This short video covers what you need to know about the Durotrak Bushing. The Patented Durotrak™ Bushing (metalcloakpatents.com) is a bushing made with a proprietary rubber compound unique to MetalCloak. The Durotrak™ bushing is comprised of two pieces that thread together allowing this bushing easy to install without a press. Eliminate squeaks and clunks in your steering with the technology of MetalCloak's Durotrak™ bushings; exclusively found in MetalCloak track bars. The Patented Durotrak™ Bushing (metalcloakpatents.com) is a NVH (noise, vibration, harshness) bushing made with a proprietary rubber compound unique to MetalCloak. The Durotrak™ two part bushing is comprised of two pieces that thread together making this bushing simple to install without a press, reduces vibration and harshness transferred to the driver, and improves vehicle steering input. Formed for ultimate Up-Travel & Down-Travel we built it out of Solid Chromoly for strength and equipped it with our patented Duratrak bushing for improved durability and ride stability. SOLID CHROMOLY FRONT TRACK BAR KEEPS YOU... WELL... ON TRACK. 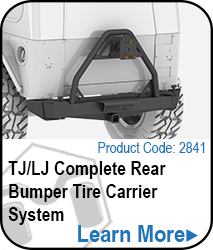 Formed for ultimate Up-Travel & Down-Travel the TJ Wrangler Front Track Bar gives strength, clearance, ultimate clearance and is equipped with our Patented Duratrak bushing for improved durability and ride stability. STOP THE GUESS WORK. BUMP IT UP! bump stop you need, when you need it. Get Correct Bump-Stop Height Every Time! 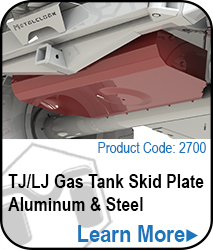 Check out what Jeepers everywhere are saying about our products on The Buzz Page. 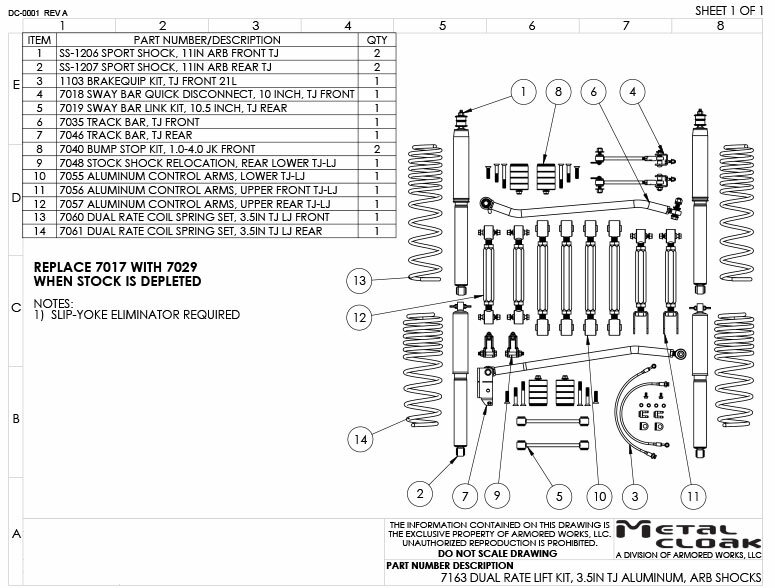 At MetalCloak we work continuously to give you the best possible installation instructions. We constantly take customer feedback and look at how we can make the instructions better for you. Click below to see our full list of installation instructions. 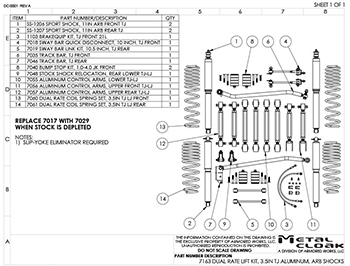 Click Here to see a full list of MetalCloak Installation Instructions.